Marching bands are made up of a variety of instruments, some of which are uncommon in other musical ensembles. Thanks to their unique instrumentation and talented musicians, they not only bring outstanding music to events but also charisma and fun. Every instrument brings a unique sound and vibration to musical arrangements. 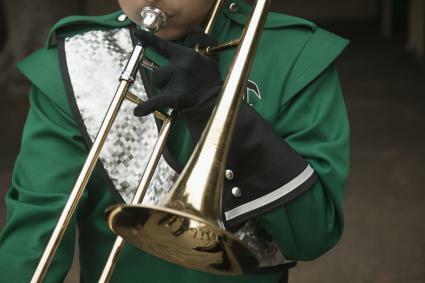 The following instruments are all commonly found in a marching band. 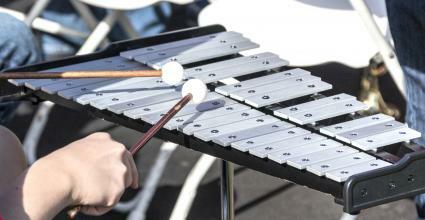 The percussion section,or drum line, of a marching band is critical because it provides the tempo for the entire band. Many people know that the percussion section includes drums and cymbals, but it can also include much more. 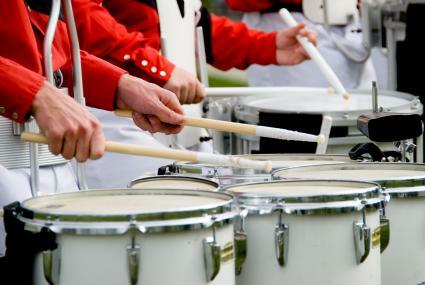 Snare Drum: This drum is the most commonly used drum in marching bands and provides a strong, piercing beat. It's used to produce drum rolls and is a great option for performing solos. Tenor Drums: Tenor drums, also called quads, are sets of four to six drums mounted together for carrying and playing. The configuration is usually made up of four main drums and two accent drums, although this can vary. Tenor drums add vibrancy to any song. 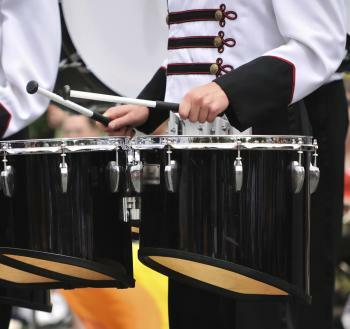 Bass Drum: This drum is very large and is usually attached to the body by shoulder straps. Striking it with a soft mallet produces a powerful, deep bass tone. 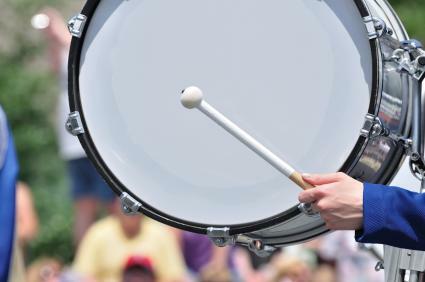 A pitched bass drum can also be used in marching bands. This drum can betuned to a specific musical note. 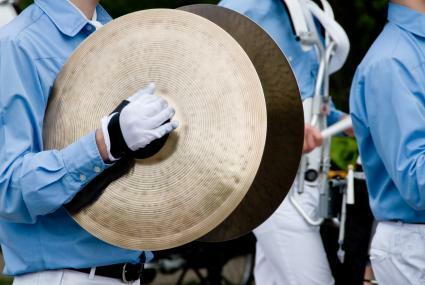 Cymbals: These large, round metal plates make a very loud, high-pitched sound when crashed together. Holding the cymbals close together and tapping them lightly produces a much more muted sound. Bells or Glockenspiel: The glockenspiel is made of metal bars that represent the higher tones of the musical scale, like those on the treble clef of a piano keyboard. It's a very large instrument and is usually attached to the body with a shoulder harness. Each bell produces a melodic, high-pitched tone. 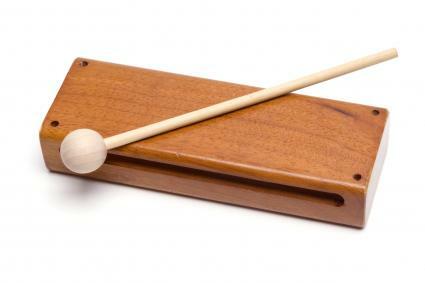 Wood Blocks: Usually made from teak, wood blocks add a bright sounding beat to music. 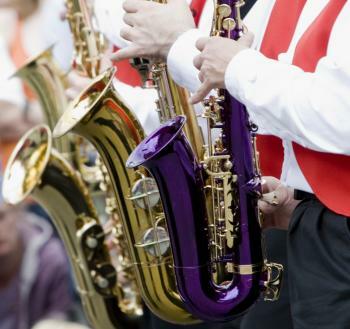 The brass section of a marching band adds powerful, rich tones and vibrations to music. 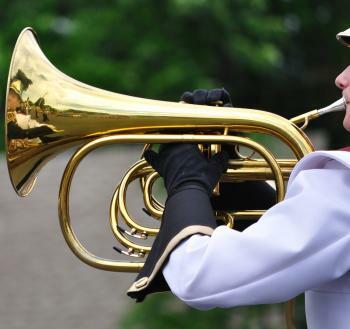 The instruments are a gorgeous, polished brass that look beautiful during marching events. Trumpet: To play this instrument, air is blown through closed lips into a mouthpiece and valves are pushed to produce specific musical notes. Trumpets often play the melody line of a tune but can also play harmony. Cornet: Similar to a trumpet but with a mellower tone, the cornet is a popular marching band instrument because of its small size. Trombone: This unique instrument uses a sliding system to produce various musical tones. It can play melody or harmony. 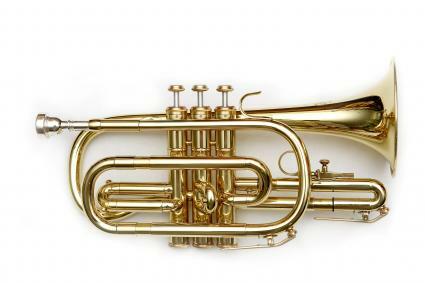 Mellophone or French Horn: The mellophone looks like a cross between a French horn and a trumpet. It's often used in marching bands in place of the French horn because its bell faces forward instead of sideways or backwards. This helps to amplify the sound. French horns are also common in marching bands as they add depth to the bass lines of the music. 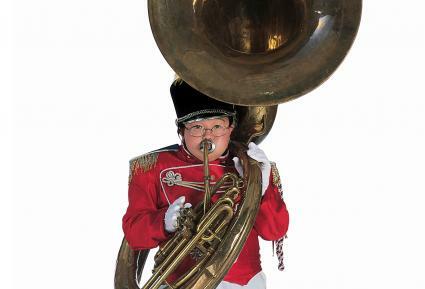 Sousaphone Tuba: The tuba produces the lowest sounds in the marching band. This extremely large instrument produces intense, bass tones that add harmony and rhythm to music. Sousaphone tubas are often seen in marching bands because they are made to coil around a performer's body for easy carrying. 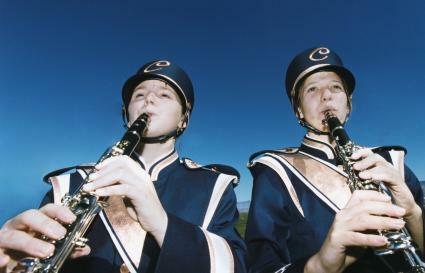 Woodwind instruments add variety to any marching band. Some instruments play softer melodies while others add jazzy undertones. Flute: The flute is a reedless instrument that produces beautiful, high-pitched tones. It often carries the melody of a musical piece. Clarinet:This reed instrument has a cylindrical shape that forms a bell at one end. It can play many tones both high and low, with a great range of sound. 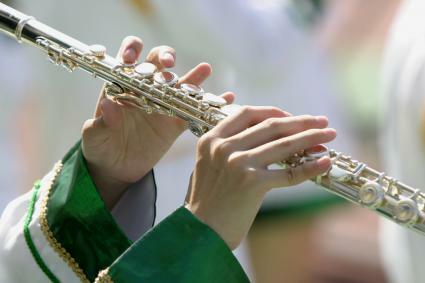 Piccolo: The piccolo is basically a small flute, and the highest pitched instrument in most bands. It adds vibrancy to music compositions and is often played in solos. Saxophones: Probably best known for its use in jazz music, the saxophone is a powerful and extremely versatile instrument. Although made of brass, the saxophone is considered a woodwind instrument due to its reeded mouthpiece and playing technique.The alto saxophone is used to play a wide range of music genres and has a higher pitch than the tenor sax. The tenor saxophone has a larger mouthpiece that connects to a crook in the neck, and produces a deeper, bass sound. The Ohio State University Marching Band has 225 instruments and features no woodwinds. The University of Michigan Marching Band features 342 instruments, including 106 woodwinds, 202 brass instruments, and 34 percussion. 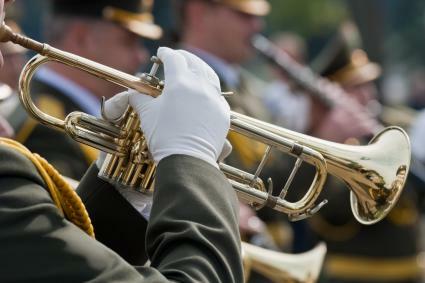 No matter how many instruments make up a marching band, it's important to have a well-balanced sound with a heavier brass section and fewer woodwinds. The drum line will usually feature the lowest number of instruments. In addition to instruments, many marching bands add exciting other elements to their performances. 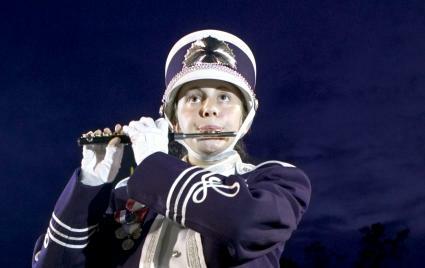 For example, some bands may feature a color guard or majorettes. They may also have groups of dancers or acrobatic performers. The entire band is usually headed by an elaborately dressed drum major who helps keep the band in rhythm and directs their marching and performances. Marching bands have been bringing joy to crowds for decades. 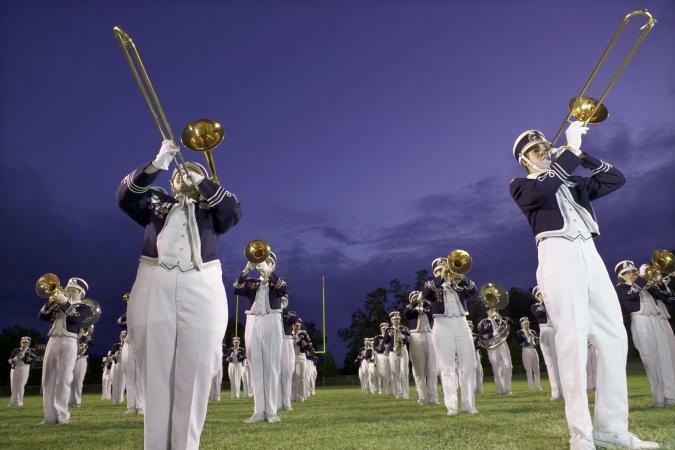 Whether they're marching in a national parade or performing at an evening hometown football game, the bands bring excitement and flair to the audience. They continue to raise the entertainment bar and will no doubt be an event staple for generations to come.